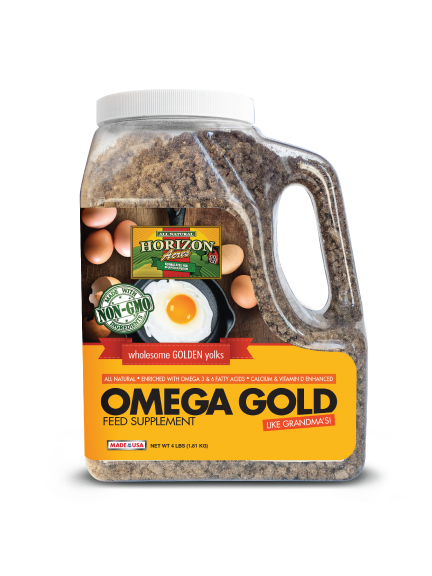 Omega Gold is a nutritional supplement designed to be fed with Horizon Acres Egg Layer Pellets or Crumbles. It is free of genetically modified ingredients, medications and hormones. It naturally provides Omega 3’s, an essential fatty acid, which is beneficial to your chickens and also to you! After 3-4 weeks your eggs will have a significantly higher amount of Omega 3’s (an essential fatty acid naturally found in fish shown to improve human health). Omega Gold also has natural pigment enhancers, called carotenoids that will make your chickens’ egg yolks beautiful golden color, just like Grandma’s! It is available in a convenient 4lb jug.